This is the back story to the book Lean University. Higher education has been in trouble for some time now. Why is that? In part, it is because university leaders have long thought universities are different from other types of organizations – so much so, that they can manage poorly for decades and largely ignore the environment around them, and that there would be no great consequences for doing that. But, complacency has caught up to those leaders who have preferred to do things the way they have always been done. Facing short-term emergencies and long-term structural challenges, universities leaders are searching for solutions to fundamental problems. Remarkably, the get-well plan is simply to copy what other university leaders are doing. There is an almost complete lack of original and creative or innovative thinking. This is not surprising. Most organizations are led by people steeped in conventional management practice. It is rare to find a senior leader who willing to learn new and different ways of leading – to be a progressive leader. To challenge themselves as they so readily challenge others. Having worked in higher education for 15 years, I am all too familiar with the few strengths and many weaknesses of university leadership. In particular, the large gap between what university leaders think is going on and what students experience. University leaders flaunt successes, while student lament difficulties with basic administrative and academic processes. University leaders assume teaching is good because teaching happens. They assume students (and parents) are satisfied because they smile at graduation. They ask the students questions on surveys that do not reflect the core mission of higher education. And they largely ignore student feedback. This is not much of a problem when students have no choice; when higher education is a sellers’ market. But, higher education has quickly shifted from a sellers’ market to a buyers’ market (driven in part by steady increases in tuition and steady declines in real income). That’s a huge change for leaders who have know only sellers’ markets. They are not prepared to lead the university forward in competitive buyer’s markets. At the same time, the value of higher education proposition has declined for students, payers, and employers. That, along with demographic trends, leaders to lower enrollments, so every leader commissions a team to create an enrollment improvement plan that looks like every other university’s enrollment improvement plan. How do you improve the value proposition in an increasingly competitive buyers’ market? How do you deal with all these problems in ways that lead to actual improvement, as opposed to the appearance of improvement? 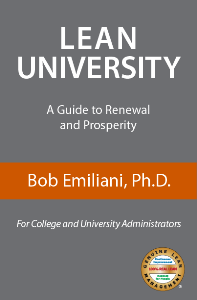 I wrote Lean University to educate university leaders of a practical, alternative approach for improving how to lead and manage higher education institutions. It is an approach that has worked very well in other organizations where leaders were willing to learn new ways of thinking and doing things, and to lead others by demonstrating what they have learned though daily practice. Lean University informs university leaders, from department chairs to president and board members, of the purpose and rationale of Lean management and how it is a management system as well suited for higher education as it is for hospitals or manufacturing businesses. It offers a better and clearer vision for meeting the needs of students, payers, and other key stakeholders. Alternative courses of action will likely consume a lot of time and cost a lot money with no actual improvement in administrative and academic processes, leaving the value proposition for students and payer largely unchanged. While money wasted can be replaced, but lost time cannot be recovered. Leaders, real leaders, are more responsible for time than for money (budgets). Lean University teach that to them.